Met's Training & Placement Department is playing an important role in student's future as an indispensable pillar of the Institute. This department continuously strives to help students in pursuing their career goals by acquiring employment-seeking skills and ultimately to attain desired employment. This is accomplished through building a strong partnership amongst students, alumni, faculty members and industries. 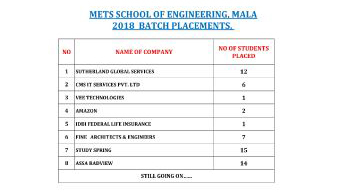 MET'S has a fully developed placement cell which will help students in their career planning, preparation for selection tests and final placements. Our Placement Cell has strong contacts and effective communication links with many prominent industrial and business organizations. The placement cell will take all out effort to match students' career aspirations with the requirements of these organizations. Preparation of placement list of corporate and other institution from all over India and also from the overseas. Placement cell will liaison with the senior company executives of reputed corporate. Timely preparation of placement brochures and its distribution to concerned industries and corporate. We are providing full-fledged training on soft skills, analytical ability and life skills on regular basis, under Soft skill department. The Placement cell of the College closely monitors employment opportunities for our students in India and also abroad. Placement cell is in constant touch with reputed companies for Campus Recruitment of our eligible students. 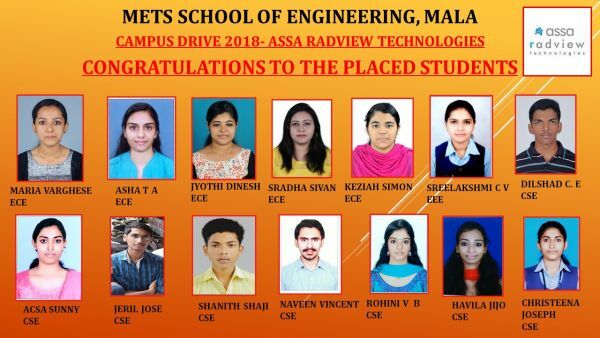 Many of our students are already placed in renowned companies like Infosys, TCS, L&T, CTS, Accenture, Mahindra, E&Y, Birla Cement, Bajaj Electricals, Indian Navy, BSNL and other coveted Corporate. i - Learning is a cloud based Integrated Learning and Self-assessment Platform. It facilitates students a well advanced online cloud based system to practice on various kinds of aptitude tests, and also provides platform for mock tests and interviews. Besides the aptitude skills, this system helps students to develop their writing skills through various online monitored practicing platforms. Our Soft Skills Training programme encompasses a range of skills that most organizations find to be absolutely essential for their success and onward march. Here at MET's, we train our students in various skills that will stand them in good stead as they look for placements in key positions in prestigious institutions. Analytical skills—qualitative and quantitative—gives student fire power, know how to find, analyze and transform information so they can build better strategies and make more effective decisions. These critical thinking courses and seminars will help students leverage priceless knowledge and quickly seize unseen opportunities for growth and success. LST's primary objective is to enhance the development of basic life skills, personal competence, and skills related to resistance to social influences that promote substantial benefits. MET'S is conducting seminar programs on Life skills for faculties and students in the following areas -Social skill, Thinking skill and Emotional skill. In the recruitment drive held in our College on 31.10.2017 by M/S SUTHERLAND GLOBAL SERVICES, the following 8 students have been selected as consultants (voice). We are also awaiting results of further candidates selected for consultants (non-Voice).You mayin congratulate the students selected. We take this opportunity to thank all faculties assisted the drive in the seminar hall.